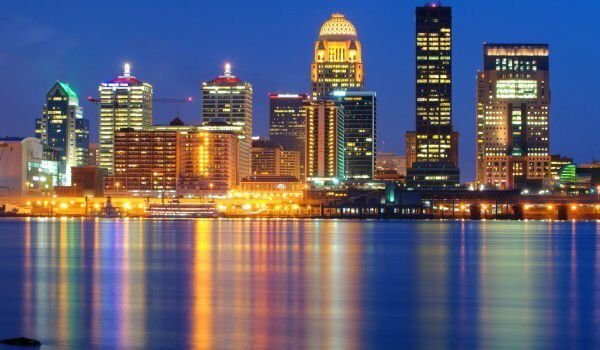 Louisville is the largest city in Kentucky, USA. It is extremely popular, especially with their traditional horse races. Louisville is located in the north central part of Kentucky. Through the town passes the picturesque Ohio River, this plays an important role in the development and prosperity of the city. Around it is now located the industrial part of town. Most impressive are the twelve modern skyscrapers, located near the waters of Ohio. In the center of town is the charming white building of Louisville City Hall. The building is considered one of the historical landmarks in the United States. The Cathedral of the Assumption is also located in the center, giving a magnificent look of the cityscape. Since Louisville is located in the middle of the United States is difficult to determine which cultural traits are dominant - northern or southern. Rather, the city is a beautiful mix of the two opposites. An interesting detail is that one third of bourbon in the U.S. comes from Louisville. In the city are important distillation centers. As it became clear, the city is best known sporting races called the Kentucky Derby. Even more exciting than the stakes are the lavish fireworks, marking the end of the event. It is believed that the light show is the largest such event in the U.S.
Another colorful event that attracts many tourists and lovers of excitement is the Bluegrass Balloon Festival. It involves over 100 hot air balloons, which compete in 3 different races. The Air Fest is garnished with many live music shows and over 150 collectible old cars. This party each year is visited by around 100, 000 people. If you decide to visit Louisville in October, you will witness another attractive Arts Festival – the St. James Court Art Show. The event is held in the old part of town. The idea is for thousands of talents to present and sell their works of art to locals and tourists. The art show enjoys a large attendance from both ordinary visitors and rich collectors. It is believed that the creative exhibition is the most popular attraction in Louisville after the horse races. In Louisville is one of the few preserved old quarters in America, whose houses evoke the Victorian architectural style. It's the old part of town. Old Louisville consists of approximately 40 streets. In the scientific area, Museum Row, the curious can visit the many museums of Louisville. If you are wondering where to drink a cup of coffee or tea, you can do this on board another landmark - the ship Belle of Louisville, located in the Ohio River in downtown. The beautiful vessel is considered one of the historic emblems of the United States. The green treasure in the heart of the city is called the Louisville Waterfront Park. There, residents and tourists can enjoy the great river view. Moreover, in the green zone, there are conditions for holding concerts and other major festivals and events. The park harbors quiet places, where you can read a book or organize a picnic with family and friends. The park is 290, 000 square kilometers big. Interestingly, prior to its opening in 1999, the space was used for storage of industrial waste and scrap. It is interesting to note that Louisville was founded in 1778 by George Roger Clark and is named after the French King Louis XVI. Louisville has been home and inspiration for many celebrities, some of which have changed the world forever. Among them are Thomas Edison, legendary boxer Muhammad Ali and actor Tom Cruise.